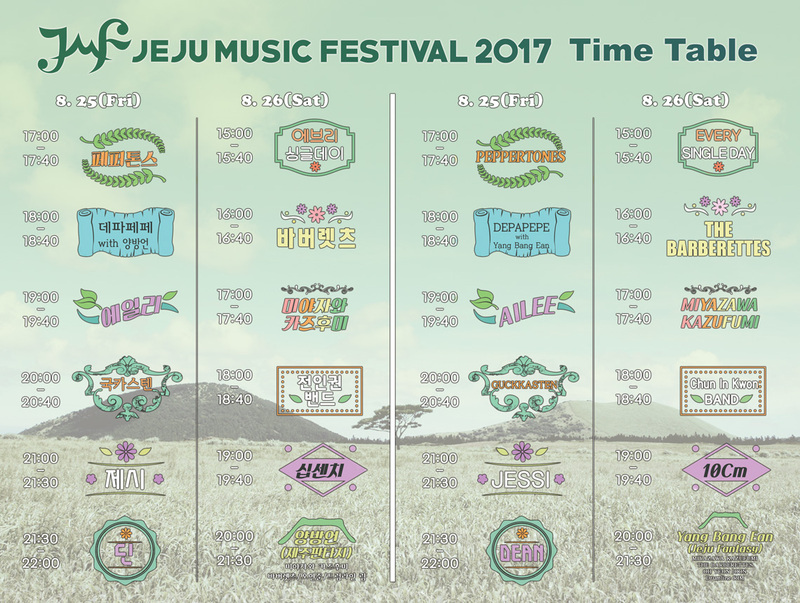 Jeju Music Festival is a rare opportunity to see some of Korea’s stars on the island. The festival will be held at the Elysian Jeju Resort on Aug. 25 and 26. Dean (딘) will headline on Friday night with support from Ailee (에일리), Dapapepe (데파페페), Gukkasten (국가스텐), Jessi (제시), and the Peppertones (페퍼톤스). Meanwhile, on Saturday Yang Bang Ean (양방언) will top the bill with 10cm (십센치), Every Single Day (에브리싱글데이), Chun In Kwon band (전인권 밴드), Miyazawa Kazufumi, and The Barberettes (바러렛츠) playing earlier in the day. On Aug. 25 (Fri.), admission will be from 3 p.m. while the Festival will start at 5 p.m. and continue until 10 p.m. On Aug. 26 (Sat), the concert will begin at 5 p.m. with admission starting at 3 p.m. Entry to the event is free. The first 3,000 people will also get a free beer from Jeju Music Festival sponsors Jespi as well as being added into a draw to win tickets to attractions on Jeju. People can buy food at the venue. There is also a standing zone and a picnic zone so that people can enjoy the festival in a relaxed atmosphere.